U.S. Envoy Leaves Syria Due To 'Credible Threats' : The Two-Way Ambassador Robert Ford has called attention to the Assad regime's violent crackdown on opponents. In September, his convoy was attacked. Now, there are new threats, the U.S. says, and it blames the regime. "The U.S. has pulled its ambassador out of Syria over security concerns, blaming President Bashar Assad's government for the threats.," The Associated Press writes. 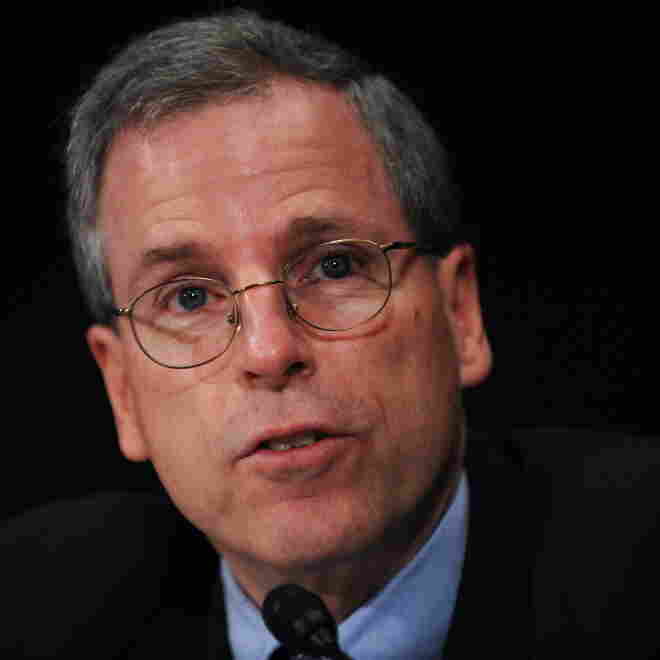 "State Department spokesman Mark Toner said Monday that Ambassador Robert Ford returned to Washington this weekend after 'credible threats against his personal safety.' "
The wire service adds that "Haynes Mahoney, the Deputy Chief of Mission at the U.S. Embassy in Damascus, confirmed that Ford was out of the country but emphasized that Washington has not formally recalled him." "At this point, we can't say when he will return to Syria. It will depend on our assessment of Syrian regime-led incitement and the security situation on the ground. "We hope that the Syrian regime will end its incitement campaign against Ambassador Ford." Reuters reported earlier that according to "Western diplomats," the ambassador "left Syria over the weekend." As we reported on Sept. 29, Ford has gotten considerable attention for his meetings with opposition figures as protests against the Assad regime have continued over recent months. His efforts have not gone over well with the Assad regime. Government supporters at one point threw stones, eggs and tomatoes at Ford's convoy as he went to meet with an opposition leader. They also surrounded the building where the ambassador was meeting with that opposition figure. "Perhaps the biggest difference now between the Syrian regime and most of the international community is that the regime has not acknowledged that its forces are often killing unarmed protesters. Unfortunately some Americans in Iraq and Afghanistan committed violations and were imprisoned for their actions. Have any Syrian security members been punished for killing unarmed protesters or torturing prisoners? Changing the mentality of the security forces might take time, but a government that wants to build credibility on human rights and reform has to start sometime and somewhere with concrete steps." Ford has been the ambassador in Syria since January. Other posts he has filled include deputy chief of mission at the U.S. embassy in Baghdad and ambassador to Algeria. Update at 12:40 p.m. ET: According to the AP, a "Syrian official" says that his country's ambassador to the U.S. has been recalled.